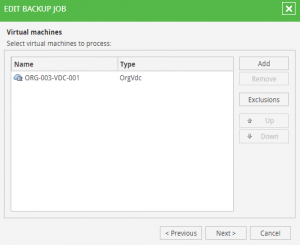 Automation Archives - VIRTUALIZATION IS LIFE! Last week I attended the Sydney and Melbourne VMUG UserCons and apart from sitting in on some great sessions I came away from both events with a renewed sense of community spirit and enjoyed catching up with industry peers and good friends that I don’t see often enough. 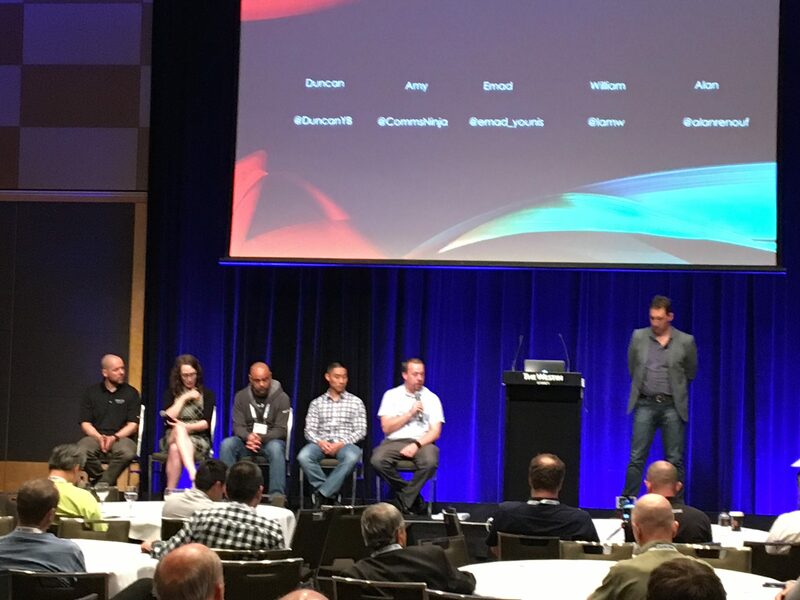 While the VMUG is generally struggling a little around the world at this point in time, kudos goes to both Sydney and Melbourne chapter leaders and steering committee in being able to bring out a superstar bunch of presenters (see panel below)…there might not be a better VMUG lineup anywhere in the world this year! There was a heavy automation focus this year…which in truth was the same as last years events however last years messaging was more around the theory of _change or die_ this year there was more around the practical. This was a welcome change because, while it’s all well and good to beat the change messaging into people…actually taking them through real world examples and demo’s tends to get people more excited and keen to dive into automation as they get a sense of how to apply it to their every day jobs. In the VMware community, there are not better examples of automation excellence than Alan Renouf and William Lam and their closing keynote sessions where they went through and deployed a fully functional SDDC vSphere environment on a single ESXi host from a USB Key was brilliant and hopefully will be repeated at other VMUGs and VMworld. 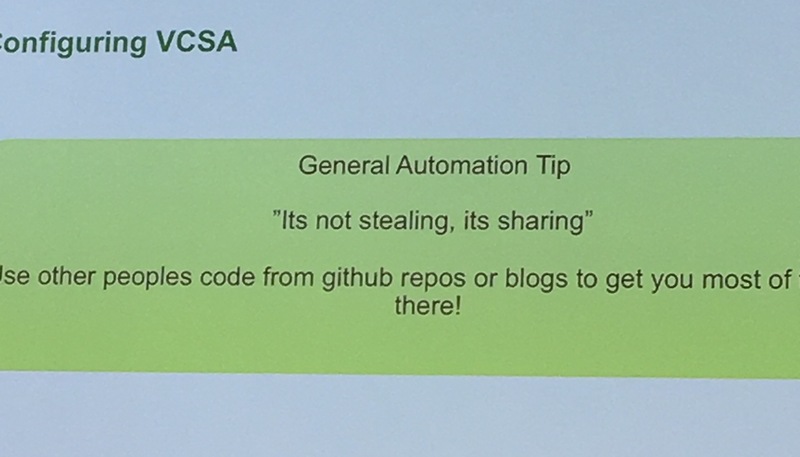 This project was born out of last years VMworld Hackerthon’s and ended up being a really fun and informative presentation that showed off the power of automation along with the benefits of what undertaking an automation project can deliver. During the presentation Alan Renouf shared this slide which got many laughs and resonated well with myself in that apart from my very early failed uni days, I don’t think I have ever created a bit of code or written a script from scratch. 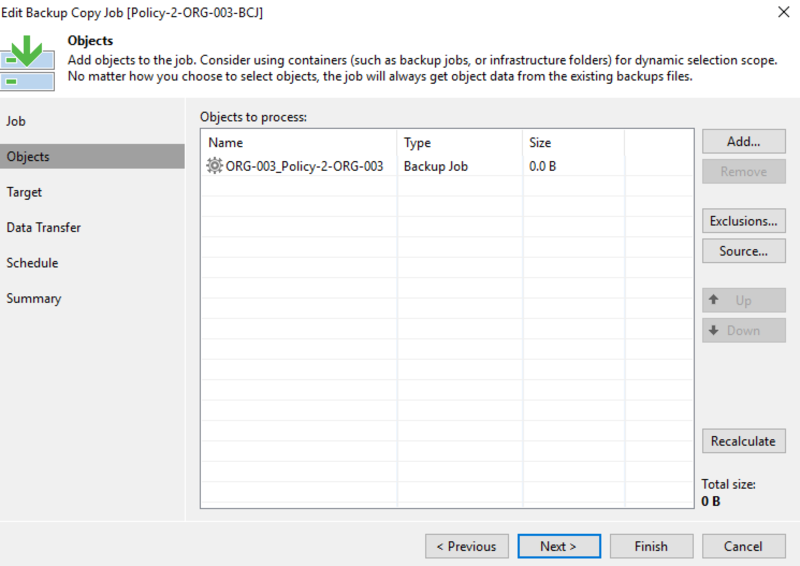 There is somewhat of a stigma attached with “borrowing” or “stealing” code used to modify or create scripts within the IT community. 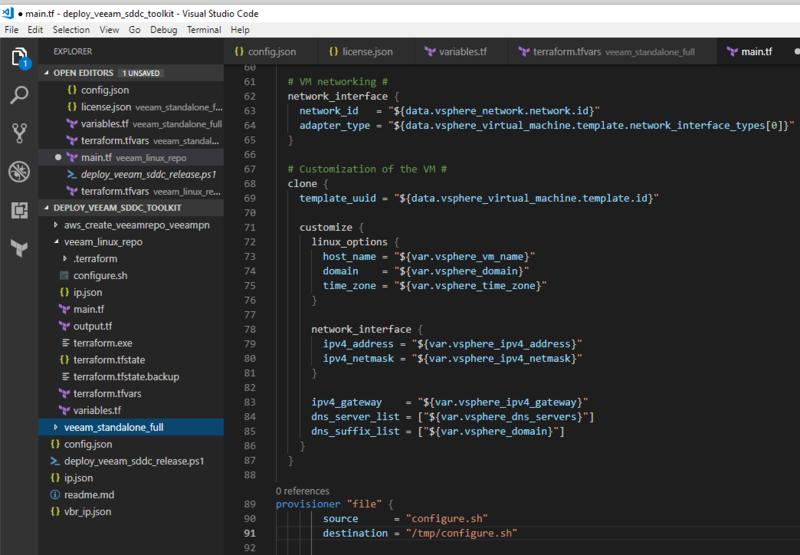 There might also be some shame associated in admitting that a bit of code wasn’t 100% created by someone from scratch…I’ve seen this before and I’ve personally been taken to task when presenting some of the scripts that I’ve modified for purpose during my last few roles. What Alan is pointing out there is that it’s totally ok to stand on the shoulders of giants and borrow from what’s out there in the public domain…if code is published online via someones personal blog or put up on GitHub then it’s fair game. There is no shame in being efficient…no shame in not having to start from scratch and certainly no shame in claiming success after any mods have been done… Own it! Overall the 2017 Sydney and Melbourne UserCons where an excellent event and on a personal note I enjoyed being able to attend with Veeam as the Platinum Sponsor and present session on our vSAN/VVOL/SPBM support and introduce our Windows and Linux Agents to the crowd. 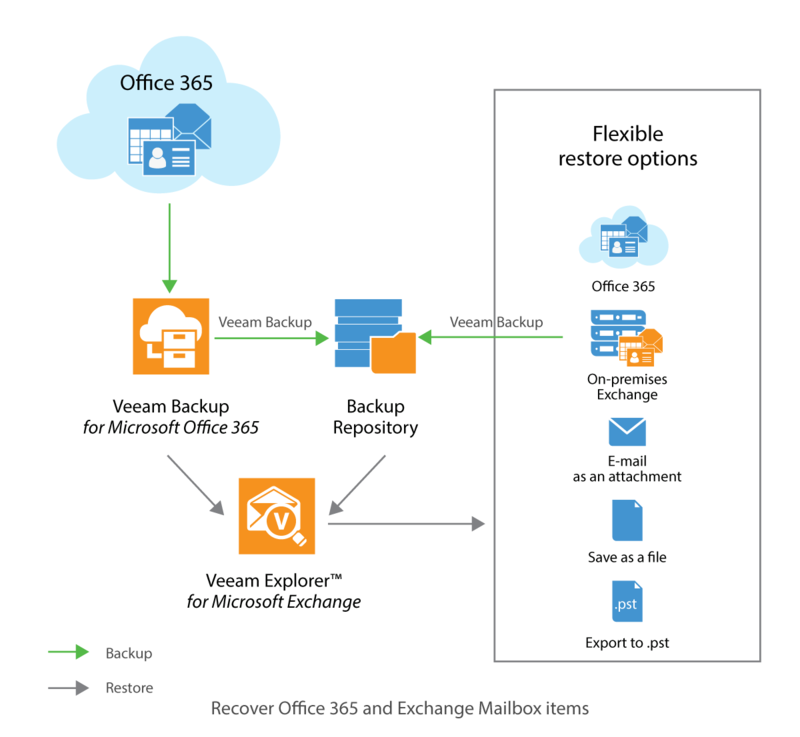 The Melbourne crowd was especially engaged and asked lots of great questions around our agent story and where looking forward to the release of Veeam Agent for Windows. Again the networking with industry peers and customers is invaluable and there was a great sense of community once again. The UserCon events are of a high quality and my thanks goes out to the leaders of both Sydney and Melbourne for working hard to organise these events. And which one was better? …I won’t go there but those that listened to my comment during our Sponsor giveaways at the end of the event knows how I really feel. Welcome to 2017! To kick off the year I thought I’d do a quick post on a little known product (at least in my circles) from Red Hat Inc called ManageIQ. 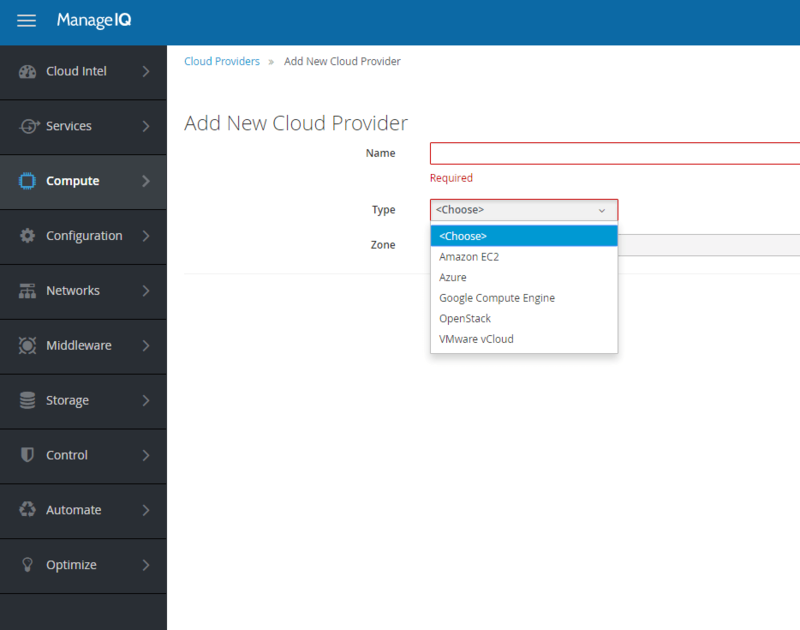 I stumbled across ManageIQ by chance having caught wind that they where soon to have vCloud Director support added to the product. Reading through some of the history behind ManageIQ I found out that in December of 2012 Red Hat acquired ManageIQ and integrated it into its CloudForms cloud management program…they then made it open source in 2014. CloudForms is a cloud management platform that also manages traditional server virtualization products such as vSphere and oVirt. This broad capability makes it ideal as a hybrid cloud manager as its able to manage both public clouds and on-premises private clouds and virtual infrastructures. This acts as a single management interface into hybrid environments that enables cross platform orchestration to be achieved with relative ease. This is backed by a community that contributes workflows and code to the project. The supported platforms are shown below. The October release was the first iteration for the vCloud provider which supports authentication, inventory (including vApps), provisioning, power operations and events all done via the use of the API provided by vCloud Director. First and foremost I see this as a client facing tool rather than an internal orchestration tool for vCAN SPs however given it can go cross platform there can be a use for VM or Container orchestration that SPs could tap into. 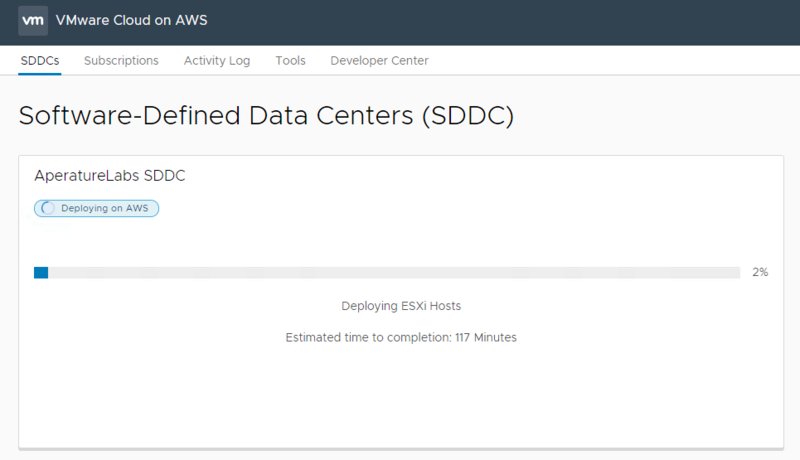 While it’s still relatively immature compared to the other platforms it supports, I see great potential in this and I think all vCAN Service Providers running vCloud Director should look at this as a way for their customers to better consume and operate vCD coming from a more modern approach, rather than depending on the UI. Next add in the URL of the vCloud Director endpoint with it’s port…which is generally 443. For the username, you use the convention of [email protected] which allows you to login specifically to your vCD Organization. If you want to login at an admin enter in [email protected] to get top level access. 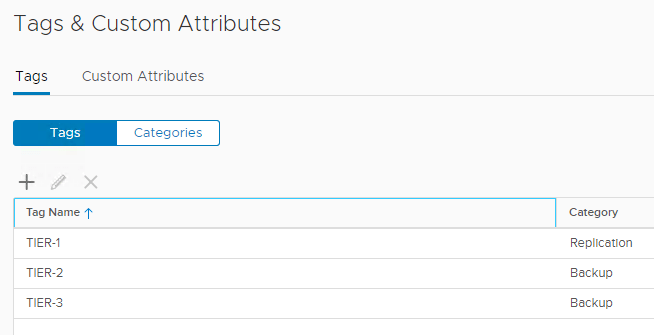 Once connected you can add as many vCD endpoints as you have. 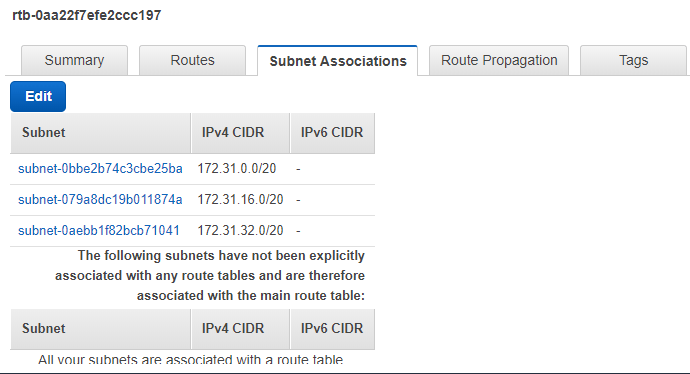 As you can see below I am connected to four seperate instances of vCloud. 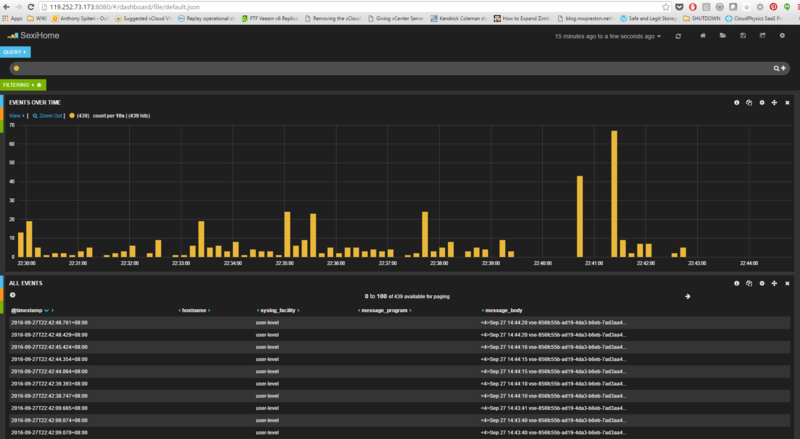 Clicking through you get a Summary of the vCloud Zone with it’s relationships. 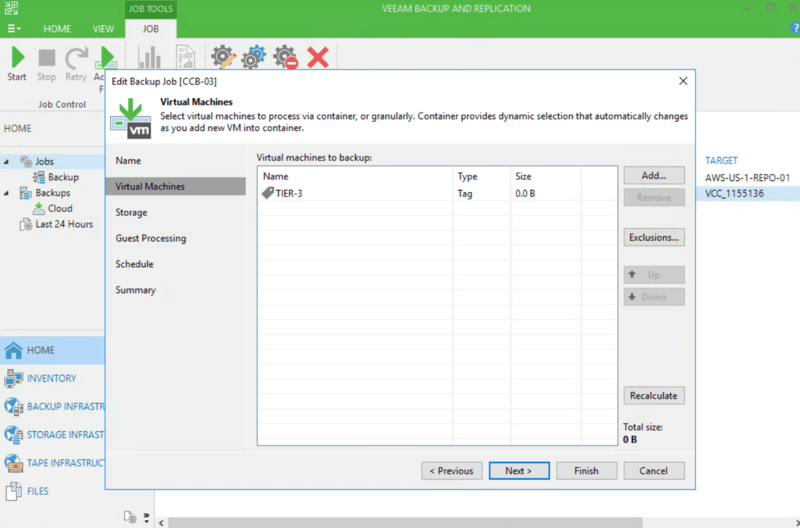 Clicking on the Instances you get a list of your VM’s, but this also has views for Virtual Datacenter, vApps and other vCD objects. 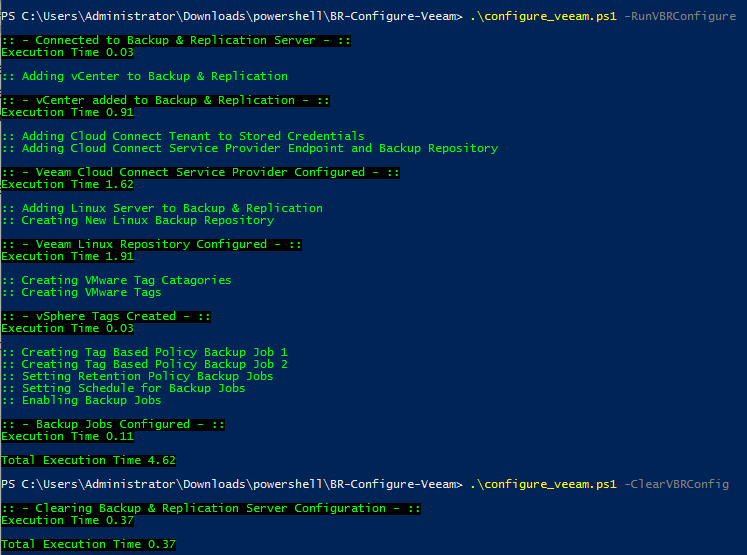 As you can see below there is detailed views on the VM and it does have basic Power functions in this build. I’ve just started to look into the power of CloudForms and have been reading through the ManageIQ automation guide. It’s one of those things that needs a little research plus some trial and error to master, but I see this form of cloud consumption where the end user doesn’t have to directly manipulate the various API endpoints as the future. 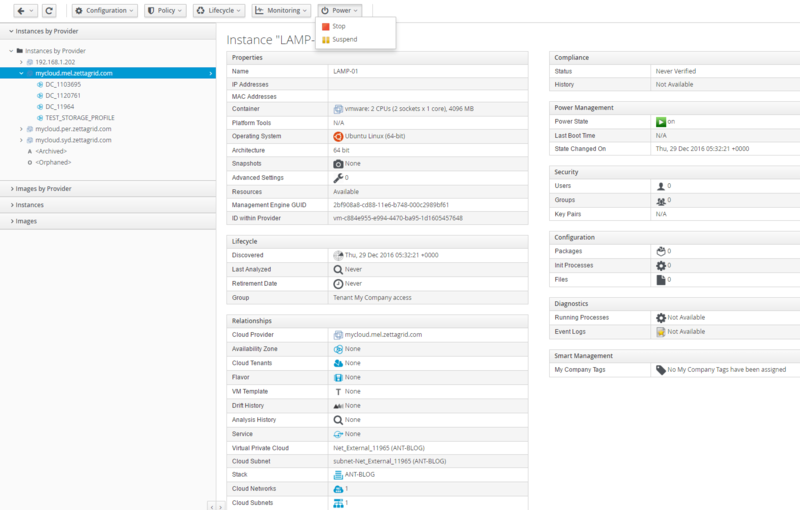 I’m looking forward to how the vCloud Director provider matures and I’ll be keeping an eye on the forums and ManageIQ GitHub page for more examples. 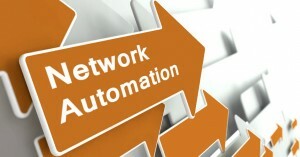 The Power of Network Automation: How a Huge Low Turned into a Great High! A few weeks back at Zettagrid we released our NSX Advanced Networking product that we have been working on for the best part of 12 months. I’m particularly proud of this release as it represents a significant realisation of a vision myself and others have had in trying to integrate NSX into the Zettagrid IaaS platform. Furthermore the release held a deeper meaning as it showed off what can be achieved when faced with disappointment and failure. Taking myself back to February of 2014 I was presenting to a government panel for a Cloud Computing tender which ended up going horribly wrong…Notwithstanding the fact that the tender had specified IaaS as the basis of the tender the presentation actually ended up being a practical test on deploying a three tier application into a Virtual Datacenter in an allotted time period which was more akin to an Managed Services Provider than an Infrastructure Provider. 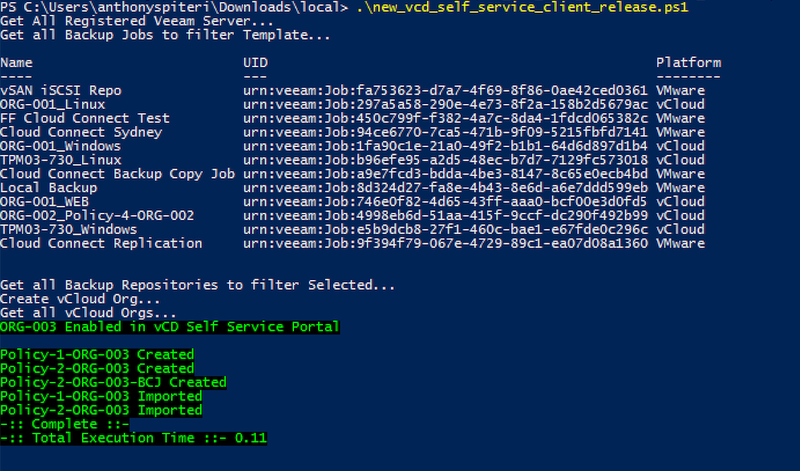 Cutting a long story short I was able to get vCloud Director configured in such a way to get the vShield to do basic load balancing but failed to produce a working IIS Default page externally which would have meant passing the test and us making it through to the next stage of the process. 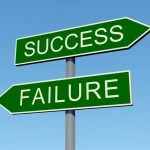 I came out of that presentation as deflated as I have been in my career…I don’t usually fail and up until that point every presentation and demo I had given had resulted in success…as I sunk down a couple of whiskey’s in the pub next to the government agency building I was trying to think to myself what went wrong? Surly there had to be a more efficient way to deploy, configure and manage networks in a cloud environment…it was decided there and then that Zettagrid would look at NSX as a way to improve network efficiency via automation. Looking back at the tender process the Government agency got it all wrong…they expected the tenderer to deploy and configure the full environment themselves…they expected a Managed Service instead of a pure IaaS. In fact it should have been that the roles were reversed and that instead of us being handed the practical example to work through the design configuration and setup it should have been them who did the configuring. They needed the tools to achieve the goal and at that stage we where not bale to provide them. That said, even with this initial release of NSX Advanced Networking the outcome might have been much of the same, though there would have been much better Load Balancing options which ultimately cost us a shot at the next round but what resonated strongly out of that afternoon was that we needed to look at network automation more seriously. There are not too many cloud providers (that don’t start with an A) that offer this service to their clients within APAC. The Hybrid Cloud is the future of IaaS and even though the landscape might change over the next 5-10 years with regards to containerised applications and services superseding more “traditional” Virtual Machine based applications the one thing that won’t change is the way in which the networking connects the client to the server and back. NSX is a great platform built from the ground up to be consumed by APIs and because of that failure 18 months ago I’m proud to have helped deliver (along with a super talented team of developers and engineers) and now work for a company that’s embraced change and is at the cutting edge of changing the way in which networks are both created and consumed using NSX as the overlay technology.